This first kind of chicken did not lead a natural, happy life before she arrived to your grocer's cooler, wrapped in plastic and injected with water (or worse!). We won't talk about just how sad the lives of these poor hens are. But after watching the documentary Food, Inc., I refuse to support big agri-businesses that raise their chickens in such unhealthy conditions. These unhappy hens led miserable lives, but are generally pretty easy to cook. Thanks to their diet, living conditions, and all that injected saltwater, they yield a moist, flavorful end result. It doesn't matter whether they're baked, stewed, roasted, grilled, or smoked. Today let's talk about how to cook those latter 2 kinds of chicken — either from your friendly local chicken farmer/neighbor/friend, or from your own backyard. And yet, since you and your neighbor don't “engineer” your chickens to be plump and juicy, you may notice tough or dry meat after cooking. Older birds (especially roosters) are less meaty and fatty, so they dry out easily when baked in the oven or on the grill. And heritage birds weigh less and have smaller breasts, so the white meat may dry out when roasting. No one wants to eat dry chicken, especially if it took years to raise, or lots of money to buy! So, what's the best way to cook pastured chicken so it's tender and juicy? Before cooking, take the time to tenderize your chicken. Once cleaned and plucked, place the bird in a tray or dish to catch any liquids that may leak. Cover it loosely with plastic wrap. Let it sit in your refrigerator for 2 to 5 days. The muscles will relax so the meat becomes tender after butchering. If thawing a frozen pastured chicken, give it at least 2 to 3 days in the fridge to thaw before cooking. Regardless of which method you choose, in the instructions below I assume that you'll be saving both the carcass and feet of the cooked chicken for bone broth. This is hands-down the best way to get your money's worth out of your pastured chicken! Stewing is your best option for a tough, old bird. Simply immerse bird in a stockpot or crock pot* filled with water. Bring to a boil and skim off any foam that rises to the top. Then lower heat and barely simmer for 3 to 5 hours. The water ensures a juicy bird, and any herbs or vegetable scraps you add will result in a lovely broth, too. Once cooked through, remove meat from the bones. Use in soups, casseroles, or chicken salad! *The water probably won't boil if using a crock pot, but that's okay. Just set the temperature to low for 3 to 5 hours. Do you consistently have dry, tough meat when using other methods? It's time to try the pressure cooker! In addition to locking in flavor and moisture, pressure cooking also significantly reduces cooking time. As in, instead of 3 to 4 hours, the pressure cooker may take less than an hour to cook your bird! Follow the instructions for your specific pressure cooker. Wardee recommends the Instant Pot or 7+ quart Duromatic Kuhn-Rikon pressure cooker if you don't have one already. First, cut up your bird. Then add coconut oil, avocado oil, or palm shortening to an enamel-coated cast iron Dutch oven. Heat over medium-high heat. Sear meat on all sides until golden brown, then remove meat and set aside. Keep drippings in the Dutch oven, and add any herbs, garlic, or vegetables you desire. Think rosemary, thyme, onions, leeks, or celery — yum! Make sure to scrape all the crisp or burnt pieces off the bottom of the Dutch oven, too, because they add amazing flavor. Then, add broth and simmer. 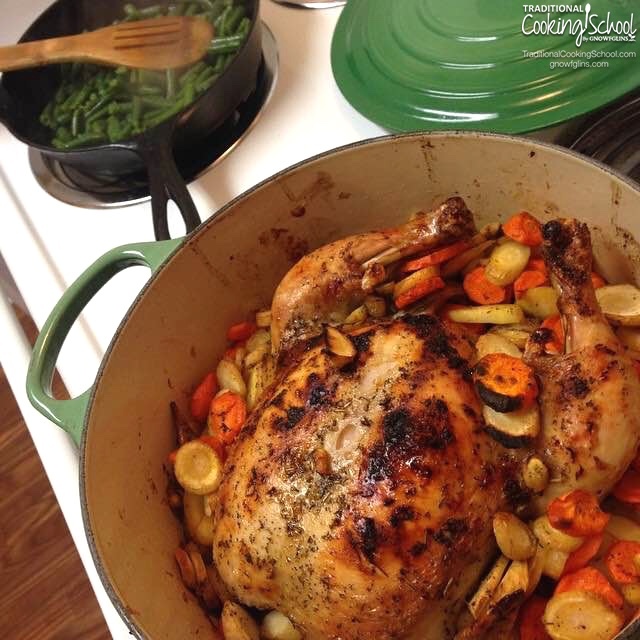 Cover Dutch oven with lid, and place in a preheated 325-degree Fahrenheit oven for 1 to 2 hours. Once meat is cooked, remove chicken and reduce sauce by simmering on the stove until thickened and reduced by 1/2. Serve chicken with this gravy generously spooned over top. Mmmmmm! I love cooking young, plump, whole birds this way! The skin gets crispy while the meat underneath stays soooo juicy. What's the secret? Creating a fat barrier between the bird and the heat so the meat doesn't dry out. This Herb-Roasted Chicken recipe is the perfect roasted chicken — tender, moist meat on the inside, crispy, flavorful skin on the outside! First, cut the chicken up and marinate the meat for 12 to 24 hours to lock in both flavor and moisture. It's very easy to dry out chicken on the grill, so this is important! Check out these marinade ideas to get you started –> Summer Shish Kabob Marinades. Grill bone-in cuts first, as these take the longest. Think long and slow instead of hot and fast. Also, avoid constantly flipping the meat. Just leave your grill lid closed and keep an eye on the temperature. You should only have to flip your meat once. What about “beer can chicken”? This type of chicken is cooked over indirect heat on a grill by placing the bird cavity over a half-full can of beer. The chicken is essentially slowly roasted with the grill lid closed. I have never made this type of chicken, but I have had it at BBQs. While it is tasty, I'm not recommending it here because I don't like the idea of heating an aluminum can inside of my food. It's the same reason why I don't cook with aluminum foil. What is your experience with cooking pastured or heritage chickens? This is very timely as we’re getting ready to process some of our pastured birds over the weekend. I look forward to trying your braising method. Sounds wonderful! A friend turned me on to brining, which works for my retiring biddies as well as extra roosters. I’ve had chickens for decades and sure was slow to figure this out! It is now the ONLY way I do chickens. In a food safe 5 gallon bucket (from coconut oil), modified with a screw on lid (from amazon) I put 2 chickens, lots of herbs (in the winter I use frozen herbs from my garden as well as dried), red wine vinegar (or other if that ever runs out), good salt, and water. I make sure the chickens are under the water with the help of a weight. I put this in the fridge in the summer (yes, it uses a lot of space, especially as I put 2 more in when I take out the first 2 to cook) or on the porch in colder weather. To cook, in the summer my husband smokes/roasts it in a propane smoker/roaster/grill also from amazon (less than $200). We use hickory chips or apple chips (backyard sourced). DELICIOUS. In the winter I cook it in my Pioneer Maid cookstove, nice and slow. I usually put water in the pan to help with moisture and end up with a lovely broth. So, in a word, Brine! oh! I leave it in the brine 2-4 days. Thanks for that great tip, Brenda! Thanks for the great brine idea! We raise our own chickens and I have a few old layers that will be processed soon and this sounds like something I would love to try. Could you give more idea of the amounts and kinds of herbs, vinegar etc? I, too, brine for 24 hours, but I simply put 1 cup of kosher salt and 1 cup of sugar in enough water to cover the bird. When ready to cook, pat dry and slather the bird in butter. Then bake at 275F until the juices run clear. That’s the only way I cook a whole bird, regardless of where it comes from. Hi, sorry – I didn’t see this right away. For each gallon of water I probably use about a half cup of sea salt (can’t afford that much real salt! ), about the same amount of red wine vinegar(fyi, vinegar tenderizes) (using this type currently because the store had it inexpensively in “beer” type bottles that I wanted for water kefir), no sugar though most brine recipes use it so feel free, and then the herbs. I have a bunch of garlic tiny cloves so I use them, and a bunch of sage leaves and lemon balm leaves so I use them. For the stuff I pay for (haha) I use more sparingly, perhaps a half tablespoon (per gallon) of anything that sounds good, such as thyme, rosemary, parsley, celery seed, and one time lemon pepper (it was good). I put 2 more thawed birds into the brine when I remove the first two and let them go a couple more days. I am very cautious about keeping them at a cold temp. After the second 2 come out, I dump the brine. Tender and juicy and flavorful every time. Yum. Just one more side note. With back yard chicken the fear is it being tough. Brining helps with that but tender is still firm to the tooth, not mush. Mush is icky. I have 4 girls to process so it will be perfect to do 2 at a time. I don’t like mush either. That’s what the store bought chicken is like— yuck! Glad to hear about the brining. I tried to roast one of the birds that we processed over the weekend. While the flavor was quite nice, the skin was tough and the meat was a tad bit chewy. :/ That, in spite of these being just five months old. I had wondered if brining was a better way of preparing them. I’ll try that the next time I prepare one. We buy chickens on sale and stock up at that time putting them into the freezer. I inspect the Bird for missed feathers and throw in into a pot and stew until the meat falls off the bones. The white meat goes to the side for casseroles, sandwiches or salad. The dark meat and small scraps go back into the pot along with Onions that are quarted, Carrots, Potatoes, Celery, corn & creamed corn, peas, parsley, salt & pepper and any other thing I feel would taste good. The correct thing to do next is to make a pie dough rolled out thin and cut into 1″ X 2″ squares and dropped into the boiling pot. I’m lazy so I get a box of Brilla Bow ties and dump half a box into it and then thicken it with corn starch. When done I pull half of the pot off to one side to cool and then freeze that either in double zip lock bags or a tupperware container for latter meals. For my wife & Me we get several meals out of one chicken. I also do this with Rabbits. 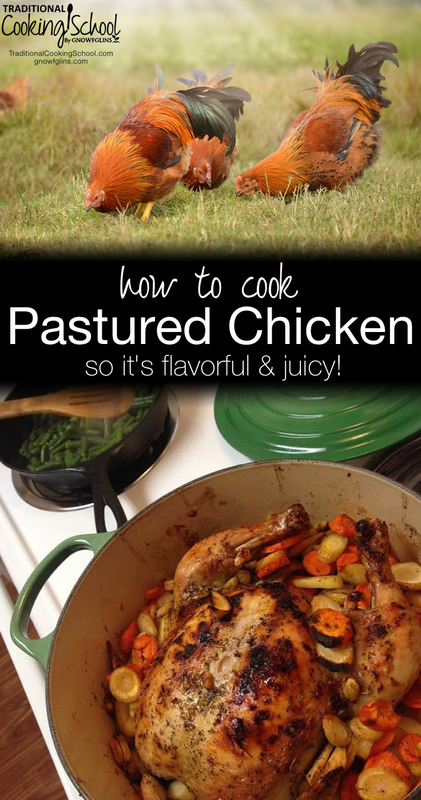 I SO want to be able to successfully cook pastured chicken for my family. I have a great source. My struggle is that despite brining, my chicken still hasn’t turned out as tender as I’d like. 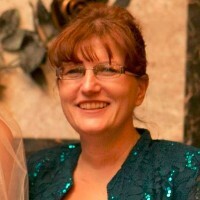 My husband has swallowing issues, so if it is not tender and juicy, he has trouble eating it. Any suggestions for us? I don’t want to have to slow cook every chicken in my crockpot, and I don’t have a pressure cooker. The funny video link doesn’t take you to a video. I clicked on both links and I only see text about plumping, no embedded video and at the bottom a call to action form. Where on that page is the video?